Acapella Violon Mk6 is an open 3-way-system. The dynamics of the 25 cm woofer have been adapted to the speed of the mid-range horn unit and the ion tweeter. The use of the ion tweeter is the fastest high frequency transmission system of the world. It operates without any mass and the upper range of the high frequencies can only be limited by the manufacturer himself. Bandwidth normally is adjusted to 40kHz approx. This extraordinary bandwidth provides an extremely precise reproduction of any kind of music. Even in the lowest frequencies you can feel exact modulation of the overtones. Fine adjustments to the ion tweeter and the mid-range horn unit can be made in order to adapt the loudspeaker to every acoustic environment. 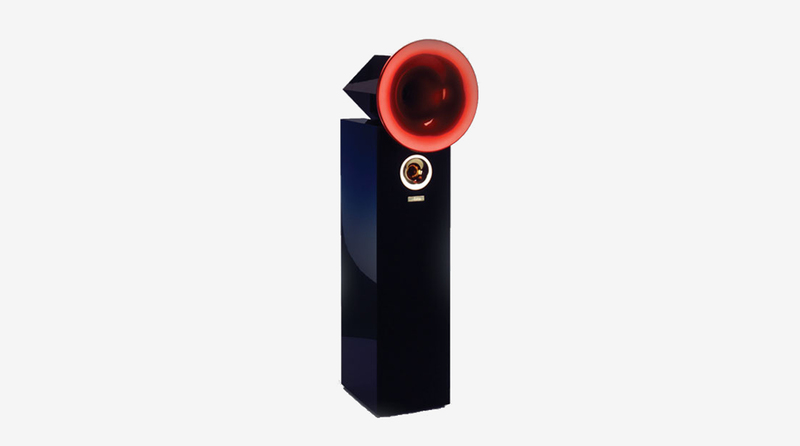 “Fantastic finish, excellent sound reproduction, finest audio measurements: Violon 6 combines the charm of a horn loudspeaker with the virtues of conventional loudspeakers”. Acapella Violon MK VI is a consequent further development of Violon 1. In contrast to Violon 1 the Violon MK VI is a closed 3 way-system, that optionally can be supplemented with a 25 cm bass device (suboctave), which itself is hidden in the enlarged total volume. Both bass devices are dynamically adapted to the high-speed of the mid-range and treble horn. Our ion treble speakers actually are the fastest treble transmission system throughout the world. As it works without mobile mass its high-end frequency amplification cut-off only depends on the limitations set by the sellers. The ion tweeter speaker is designed for frequencies up to about 40 kHz. This extraordinary width of the frequency band makes it possible to play out every kind of music precisely. The exact modulation of the upper harmonic waves can be noticed even in the deepest bass regions. This speaker can be used in each and every acoustic environment due to its adjusting possibilities that perfectly correspond to the ion tweeter speaker and mid-range horn.